Today, we are excited to announce the General Availability of Zentrunk, Plivo’s enterprise-grade SIP Trunking platform. SIP trunking has been around for many years, but surprisingly a large majority of enterprises, that need to connect to the PSTN network from their telecom infrastructure still use old and legacy connections or providers. Traditional SIP Trunking offerings involve long manual provisioning times, restricted capacity, limited feature set, and extended contract negotiations. 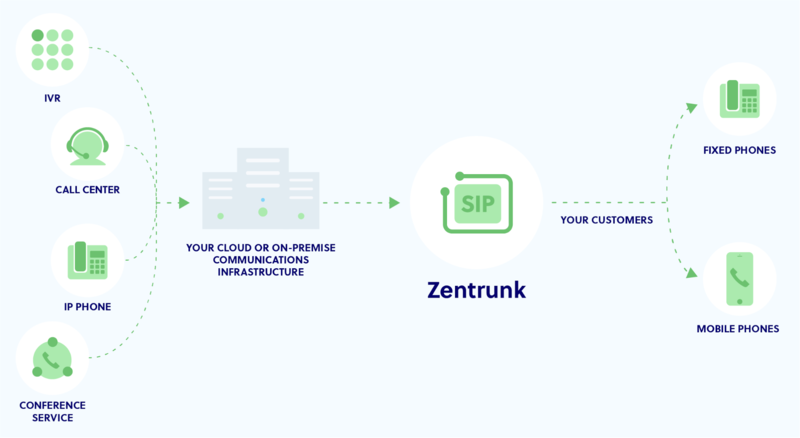 Zentrunk is a modern approach to SIP Trunking that enables instant provisioning of SIP trunks, virtually infinite cloud scale, and global reach, all powered by an intelligent routing engine in the backend. If you have your own Telecom Communications infrastructure – whether a cloud-based communications platform or on-premises equipment, Zentrunk is for you. Zentrunk enables you to connect your existing telecom infrastructure to the PSTN, without any restriction on the number of concurrent calls. Simply put, Zentrunk provides you with PSTN connectivity across 200 locations with zero contracts, pay-per-call, and unlimited capacity. Enterprise voice communication systems can immensely benefit with cloud transformation. Whether you’re looking to add a high capacity carrier that can support your growth, or just add a reliable cloud-based trunk to back-up your existing set-up, Zentrunk gets you started instantly. Global coverage: Connect with your customers over phone calls without having to deal with the complexity of telecom carriers in 200+ locations. Scalability: Zentrunk enables you to make unlimited concurrent calls. Scale your contact center or your business phone system with ease without worrying about capacity planning or channel limits. Extend your on-premise capabilities to the cloud and still keep all your business logic. High Quality: Zentrunk’s intelligent call routing engine ensures that all of your calls are routed using a local carrier based on quality real-time including Average Call duration (ACD) and Answer Seizure Ratio (ASR). Zentrunk has Points of Presence (PoPs) across 6 regions (California, Oregon, Frankfurt, Singapore, Sydney, Sao Paulo) across 5 continents ensure that you experience the lowest latency and highest voice quality. Secure Trunking: Your calls can securely connect with IP Authentication and credential based validation. Zentrunk offers Transport Layer Security (TLS) for signaling encryption and Secure Real-time Transport Protocol (SRTP) for media encryption. Transparent Pricing: Create trunks with unlimited channels and no minimum commits. Pay for voice minutes only. Pay by standard billing intervals of 6 seconds in US & Canada and 1 second in most countries. Make your billing and reporting simpler, so you have better visibility into what you’re spending on telecom and have fewer vendors to manage. The biggest benefit of Zentrunk is the ease of set-up. Zentrunk lets you provision SIP Trunks instantly through an intuitive user interface. Connect your IP-PBX or SBC to Zentrunk. Here is a detailed guide to getting started. To learn more and to get started with Zentrunk, visit, www.plivo.com/sip-trunking/.